National Flag Day is one of the public holidays in Liberia. 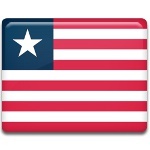 It is celebrated on August 24 to commemorate the adoption of the Liberian flag in 1847. On July 16, 1847, the Liberian Declaration of Independence was adopted, announcing the independence of Liberia from the United States. A little later, the national flag of Liberia was adopted. The Liberian flag resembles the flag of the United States. This resemblance reflects the origins of the country: the Republic of Liberia was founded by the former American slaves. Just like the American flag, the flag of Liberia has red and white stripes and a blue field in the canton. The Liberian flag has eleven stripes, symbolizing the eleven signatories of the Declaration of Independence. Red represents courage and white stands for moral excellence. The blue square is the symbol of the African mainland, and the white star on the blue field is the representation of the freedom given to the ex-slaves. Flag Day in Liberia has been observed since the adoption of the flag, but it became an official public holiday in 1915. It is a patriotic holiday that aims to play homage to the country's national emblem. It is marked with flag hoisting ceremonies and parades held throughout Liberia.